This report contains the full transcript of an interview conducted during January 2012 in Bu Thoh Township, Papun District, by a community member trained by KHRG to monitor human rights conditions. 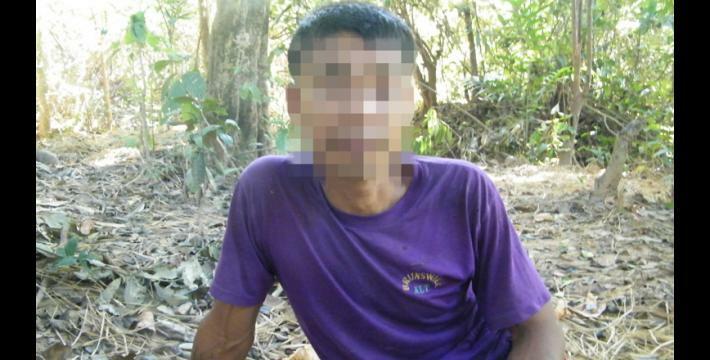 The community member interviewed Saw D---, the 44-year-old L--- village head, who described forced labour, Tatmadaw and Border Guard targeting of civilians, demands for food, and denial of humanitarian services, such as a school. He specifically described that both the Border Guard and the KNLA planted landmines around the village and, as a result, the villagers had to flee to another village because they were afraid and unable to continue with their farming. Saw D--- also mentioned that the Tatmadaw often made orders for forced portering without payment, or if they did pay, the payments were not fair for the villagers, including one villager who stepped on a landmine while portering. In addition, he described an incident in which one villager was shot at and arbitrarily tortured while returning from Myaing Gyi Ngu town to L--- village. Saw D--- also raised concerns regarding food shortages and the adequate provision of education for children. The following interview was conducted by a community member in Papun District, and is presented below translated exactly as it was received, save for minor edits for clarity and security. This interview was received along with other information from Papun District, including 12 other interviews, two situation updates and 325 photographs. People call me Saw D---. Do you have another name? My other name is Saw H---. I lived in B--- village, Kyaw Pah village tract, Bu Thoh Township, Papun district. What are you doing for your livelihood? I’m a flat field farmer. My eldest child is five years old. My youngest child is only two and a half years old. What is your position in L--- village? I’m the head of the village. How long have you been working as a village head? I have been working as a village head for only a year. Can you tell me about your experience as a village head during that year? We really had difficult times when the Tatmadaw came to our village. The villagers were afraid of the landmines that were planted in our village, so they all fled. Does the Tatmadaw always come and stay in your village? Last time, they came and stayed with me for a month and half. How many households do you have in L--- village? I think we have [censored for security] households. Can you remember the number of the villagers? I think there are over [censored for security] villagers. What are most of the villagers doing for their livelihood? Some of the villagers are hill field farmers and some are flat field farmers. Do all of the villagers get enough food from their farm work? Only some of the villagers get enough food, and some don't get enough food. Which percentage is more between villagers who get enough food, and those who don’t get enough food? The percentage of the villagers who get enough food is less than the villagers who don’t get enough food. When I’m here, I see some villagers having to buy rice every year. It’s a lot easier if you have flat fields. What do the villagers who don’t get enough food do to survive? They cut the bamboo-cane and then sell it. How much do we have to pay for bamboo? Bamboo is 250 kyat (US $0.31). Is it wah kluh or wah may ? How many cubits is a wah kluh? 12 cubits (18 ft. / 5.49 m.). Eight cubits of 100 cane [units] is 25,000 kyat (US $28.47). Are those cane poles or pieces of cane poles? All of the currency is in Kyat right? Was L--- village founded many years ago? Yes, it’s been quite long since it was founded. Have you ever faced any problem that makes you want to flee from this village and separate from each other? I have never faced this problem while I’ve been here, but I don’t know about in the past. Now, because our enemy came and planted the landmines, we separated from each other temporarily. Are you currently living in your village? No, we don’t live in our village. Why don’t the villagers dare to live in the village? We don’t dare to live in the village because the Tatmadaw always call for forced labour and the villagers are also afraid of the landmines that were planted in our village. Both the Border Guard and KNLA [Karen National Liberation Army] planted them. Both of them planted them? Yes. That’s why the villagers are afraid. Which armed group stays in your village now? Is it Tatmadaw or Border Guard? None of them stay in our village now. Just only in the past. Did you know the Tatmadaw battalion commander's name when they stayed in your village? Their battalion commander's name is Bo Mu [Major] Thiha Han. What is their battalion number? I’m not sure about their battalion number. How about the Border Guard? Did you know any of their battalion commander names? I just knew only Bo Mu Kyaw Win. He was the battalion deputy commander. They are the armed group that combines with Tatmadaw right? Yes. They combine with Tatmadaw. How many soldiers did they have? I think, only Tatmadaw soldiers, there were 67 soldiers. But I’m not sure about the Border Guard. Did they ever come to your village in December 2011? No, they came in November. What did they say and do when they came? When they came to our village, they called us for forced labour. They asked us to carry a patient. What was wrong with the patient? He stepped on a landmine. Was he a soldier or a villager? Was he a Tatmadaw soldier or Border Guard soldier? He was a Tatmadaw soldier. When the villagers came back from carrying the patient, all of their backs had bruises. Even though they paid the villagers, the payment was not fair for what they carried and how they suffered. How much did they pay them? They paid 2,000 kyat (US $2.28) a day to each of the villagers. It is really not fair. Some villagers didn’t even receive the payment. How many days did they have to carry [the patient]? You would start going in the early morning and you would arrive back to our village atnight time. Where did they go to, and take that patient from? The villagers had to take that patient from Meh Pah village and sleep there for three or four nights. After that, they brought that patient to K’ Taing Ti village. How many days did you have to sleep on the road to K’ Taing Ti? They slept on the road to K’ Taing Ti for four or five days. That’s why when they came back; their entire backs were bruised. Did you also go there? No, I didn’t but I went the next time. Last time, nine teenagers went to carry but they didn’t receive any payment. Yes, it was in November. How about the next time? Was it during November as well? Yes, the next time was also in November 2011. Did they ask permission from you when they ordered the villagers to porter? Yes, they asked permission from me and asked me to arrange the villagers for them. They didn’t pay the villagers fairly. You have to carry the things very far and they just paid them one or two thousand [kyat] (US $1.14 or US $2.28). Have you seen them ever benefit the villagers? No, I’ve never seen them benefit us. When they came to your village, did they loot and steal your chickens and pigs? I have never seen that they steal them. Just when a cow died, they took it and ate it. The villagers also allowed them to take it because we wouldn't eat it. Did the cow just die by itself? The cow got sick and died by itself. Was it a long time ago or just recently? Have you ever seen the Tatmadaw kill or torture any villager recently in your village, or the village next to you? I heard that they tortured one of my villagers in L--- village. Yes, he is my villager. They kicked him and hit him. Did he only endure it? Yes, he endured it. He is H---’s son. His name is Saw K---. I guess he is 20 years old. He is still young. Yes. He is married. He went to Hkaw Taw Pu [Myaing Gyi Ngu]. 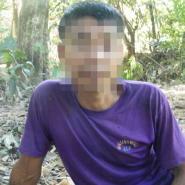 On the way back to the village, the Tatmadaw saw him and called him, but he didn’t go to them. Then, they shot at him with a gun and he went to them. Then, they kicked him and hit him. Yes, he has a boat. Have you ever been ordered to porter here? Did any of the villagers escape during portering? No, once five of us went to porter. No one escaped. Five villagers went to porter once, and another time nine villagers went. Was it both during November? Yes, it was during November. Did they give you enough food while you were portering? Once when five of us went to porter, we spent a night on the road. In the morning we arrived at their place and they fed us rice, and then we left. Did they follow you with guns? No, we just portered by ourselves. Has a battle ever happened while you were portering? No, but the first time when I went to porter, one of the villager stepped on a landmine. I think it was during last year. Did you have to carry very heavy stuff? How many viss was it? I guess over 10 viss (16 kg. / 35.2 lb.) for a person to carry. Did they hit or threaten you when you were portering? Not really, but once they pointed a gun at us to threaten us. Was it the DKBA [Democratic Karen Buddhist Army], Border Guard or Tatmadaw? Have you ever heard that they raped a woman in your village? Is there anything that you want to report about the Tatmadaw? Have they ever benefited you? No, I didn’t see anything from them that supported us. How about the Border Guard? I don’t really understand the Border Guard. We have to fear them more than the Tatmadaw. Who do you think the Border Guard is controlled by? I think they are controlled by the Tatmadaw. If the Tatmadaw orders them to do anything, they will have to do it. Did you know the battalion number of the Border Guard who lived in your village? I didn’t know their battalion number, but I guess it was Battalion #777.
Who do the Border Guard say that they are working for? They always said that they are working for the civilians, but they always call us for forced labour and portering, so, I think it is too much [to ask]. Did they give you payment when they calledyou for forced labour or portering? No, they didn’t give us payment. Did the Border Guard get paid by the Tatmadaw? Yes, the Tatmadaw pays them. Do you know how much a Border Guard soldier gets paid? I think for a soldier, it is over 30,000 kyat (US $34.17). How about the commanders? How much do they get paid? I’m not sure about that; I didn’t ask them about that. Now you don’t live in your village anymore right? Right, we don’t live there anymore. How long has it been since you fled from your village? It has already been 11 days since I fled from my village. It was before the end of December. So, I think I started to flee on December 21st or 22nd. Did you leave at the same time as the villagers? Yes, we left at the same time. Some people fled to the town, some people to the Plaw Pah Leh and some to Htee Hkee Law [villages]. But for me, I fled here, M--- village. Did you carry your food together with you when you fled? We sent the food somewhere else first. How about your chickens and pigs? All of my chickens and pigs died before I fled. Were any of your villagers left with their properties? Yes, some of the villagers still have their properties in the village, but we don’t know whether we still have it [their properties] or not in the village. When you fled, did the Border Guard and Tatmadaw stay in your village? No, they just stayed outside of our village. They didn’t stay inside our village. We were afraid of the landmines that they planted and we were also afraid that they would call us for forced labour again. That’s why we were afraid and fled to other villages temporarily. If you go back to your village, and they see you and call you, will you dare to go and meet them? We will have to discuss with KNLA first and then, if we have to go, we will go. What do you think they will do to you when they see you again? I don’t know, but I think they will definitely torture us, I guess. That’s why we always worry. Did the other villages around your village also flee? No, only the villagers in our village. Only L--- villagers fled. Where is the permanent army camp of the Border Guard and Tatmadaw located? It’s located in K’ Taing Ti. How many furlongs is your village from K’ Taing Ti? We have to walk for two hours from my village to K’ Taing Ti. Do they base their battalion or army camp in K’ Taing Ti? They based their army camp in K’ Taing Ti. Can they get internet access and phone access at their army camp? When I went to their army camp in the past, I saw a big telephone tower. What is the name of the village where you currently live? My current village is M--- village. How far is your previous village from your current village? I think it is an hour and a half away, just walking slowly. Is there any village between your previous village and your current village? Yes, there is S--- village between my previous village and my current village. Do the villagers from S--- village still stay in their village? Yes, they stay in their village. Do you have a school in L--- village? In the past they did, but it has been three years since there hasbeen one. So, you also don’t have school for this year? Yes, there is no school. Why don’t you have school anymore? There is no teacher and also, the villagers are not united. Doesn’t the Tatmadaw build them for you? No, they also don’t build any schools for us. So, where do the children in your village go and study? They go and study in Meh Nyah village. What is the highest grade in Meh Nyah? I think the highest grade is grade three. Then, how many hours does it take between your village and Meh Nyah village? It takes only half an hour. Is that the government's school or the villagers’ school? Meh Nyah School is built by the religious leader in the village for the villagers. Do the L--- villagers work freely and go anywhere freely? Starting from last year, we can’t go anywhere freely because there are some problems. Why can’t you do that anymore? We can’t do that anymore, because the KNLA also planted landmines, and the Border Guard also planted some. So, we don’t dare to go anywhere. Where did the KNLA get the landmines from? I don’t know, I think they make them by themselves. Do you think KNLA planted the landmines for their enemy or for the villagers? I think they planted them for their enemy. Do you know how the KNLA protects itself? How about Border Guard? How do they protect themselves? The Tatmadaw gave them [landmines] and they planted them. Have you ever seen the Border Guard plant landmines? I have never seen them, because they don’t call me when they go somewhere, they just call the villagers. Does the KNLA plant landmines to protect themselves? Yes, I think they plant them because they just want to protect themselves, not for the villagers. Did they inform you where they were planting the landmines? Yes, they informed us where they planted the landmines. The Border Guard didn’t really inform us. But if we have a very close relationship with them, they will tell us. Starting from last year, do the villagers dare to go and sleep at their hill field farms and flat field farms? Yes, they dare to go and sleep there, but just only some parts. How is the relationship between the KNLA and the villagers? Yes, we have a good relationship. For the Border Guard, sometimes we have a good relationship with them but sometimes not really good. Are there any villagers who are on the Border Guard’s side? I don’t know, but I think there might be some. Most of the time if Border Guard ordered us to give food, they don’t give us any payment. They just take our food freely. Some of the Border Guard treat the villagers well and some do not, right? Yes, some soldiers treat us well, but some do not. Do you know what the KNLA soldiers plan for the villagers? According to what they said, they are planning to build a road for us. What is your opinion of the Border Guard? Currently, we are afraid of the Border Guard the most. We always worry about what they will do to us. Do you think Border Guard is good? If they know themselves as Karen and reunite with KNLA, it would be really great. What are the consequent food problems from fleeing to other villages? The only food problem that we have is the rice. The rice is the main problem. We can buy the rice in the town but we don’t have money to buy any. It’s good that we have our own rice, because during a shortage, rice becomes really expensive. How about people who fled to the town, do they also get rice? No, no one gave them rice. Which one is better, fleeing to the other villages or to the town? In my opinion, I think fleeing to the village is better than fleeing to the town. If you flee to the city you will have to buy everything, even your daily food. You will have to pay for everything. I think living in the village is a lot better. If our village is safe to go back, we will go back and live in our village. Is there anything that you want to report on behalf of the villagers? We planned to build a school this year. We already discussed with the villagers, but I don’t know in this present situation, whether we can build it or not. I just want to report about the school that we are going to build. Do you have any wish for the future? I wish that we will be able to live peacefully. In order to increase the transparency of KHRG methodology and more directly communicate the experiences and perspectives of villagers in eastern Burma, KHRG aims to make all field information received available on the KHRG website once it has been processed and translated, subject only to security considerations. As companion to this, a redesigned website will be released in 2012. In the meantime, KHRG’s most recently-published field information from Papun District can be found in the report, "Papun Situation Update: Bu Tho Township, received April 2012," June 2012). As of July 3, 2012, all conversion estimates for the Kyat in this report are based on the official market rate of 878 kyat to the US $1. This reflects new measures taken by Burma's central bank on April 2nd 2012 to initiate a managed float of the Kyat, thus replacing the previous fixed rate of 6.5 kyat to US $1. These terms refer to kinds of bamboo. Wah kluh is a kind of bamboo which is a little longer than wah may. A standard measurement of the length of bamboo poles commonly referred to in Karen as the length from one’s fingertips to one’s elbow, about 18 in. / 45.7 cm. Border Guard battalions of the Tatmadaw were established in 2010; they are composed mostly of soldiers from former non-state armed groups, such as older constellations of the DKBA which concluded ceasefires with the Burmese government and agreed to transform into Border Guard battalions within the Tatmadaw. Border Guard battalions are assigned four digit battalion numbers, whereas regular Tatmadaw infantry or light infantry battalions are identified by two or three digit battalion numbers; see "DKBA officially becomes Border Guard Force," Democratic Voice of Burma, August 2010, and, "Exploitation and recruitment under the DKBA in Pa’an District," KHRG, June 2009; see also Border Guard transformation footnote above. The villager is explaining that the villagers do not have any information regarding whose property, if any, has been confiscated. 0.125 of a mile / 0.2 of a km.